It should be possible to see which blogs each TypeList is attached to from the "your TypeLists" page. Some Typelists get used on multiple blogs. It should be possible to use a different descriptive name for TypeLists than the title that displays on the blog. Multiple blogs may have the TypeLists with the same title but different content. The first one is important because you wouldn't want to accidentally delete a TypeList that appears on multiple blogs after removing from the blog where it originated. Most of my TypeLists are specific to one blog, so if I remove them, I also delete the list to avoid clutter. On rare occasions, blogs may share a list, but it's easy to forget that if you haven't edited the design in some time. The second one would be nice to change at the application level because it would make it easier to tell lists apart when they share a common title such as Subscribe, Info or About. By editing the Description Field for your TypeLists you can distinguish one list from another on the Your TypeLists Page, but in the Design Wizard they are only shown by title (in the order they were created, not in alphabetical order by filename). Really, the ideal fix would be to identify Typelists by the actual filename and continue to allow the title to be edited as needed. In the meantime, a bit of organization can make your life much easier down the road: TypeLists have an optional field for descriptive notes which you can access from the Configure tab when you are creating or editing the TypeList. By using the following conventions when creating TypeLists, you can insure that you always know what they do and where they are being used. Use a descriptive name when you create your new list, such as blogname_function (i.e. typepadhacks_subscribe). You can edit the title to read as desired (i.e. Subscribe) before adding it to your sidebar. 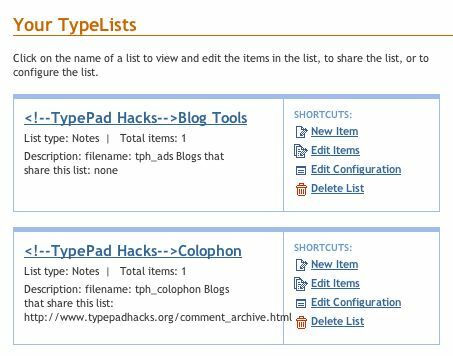 While you're cleaning up lists, you might like to organize your TypeLists by blog. Copy the TypeList filename into the Description Field so that you'll always know how to add it to Advanced Template blogs later. If you add an existing TypeList to an additional blog, note that in the Description Field.